Not to be confused with Cookies (group), an unrelated Hong Kong music group. The Cookies were an American R&B girl group active from 1954 to 1967. Members of the original lineup later became the Raelettes, the backing vocalists for Ray Charles. In 1961, a new version of the Cookies emerged in New York, with Dorothy Jones joining newcomers Earl-Jean McCrea (Darlene's younger sister) and another of Dorothy's cousins, Margaret Ross. Jones also recorded one solo recording for Columbia in 1961. 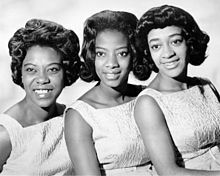 This trio had the greatest success as the Cookies: under their own name; as backing vocals for other artists, including Neil Sedaka's hit songs "Breaking Up Is Hard to Do", "The Dreamer" and "Bad Girl"; and recording demos for Aldon Music, under the direction of Carole King and Gerry Goffin. They provided the backup vocals for the Little Eva hit song, "The Loco-Motion", as well as her follow-up hit "Let's Turkey Trot", both from 1962; and for Mel Tormé's hit version of "Comin' Home Baby". They scored their biggest hit in 1963 with the song "Don't Say Nothin' Bad (About My Baby)", which reached #3 on the Billboard R&B chart and #7 on the Billboard Pop chart. A 1962 hit, "Chains", was recorded by the Beatles on their debut release Please Please Me. Earl-Jean McCrea left the group in 1965 after two solo singles, which included the first recording of the Goffin/King song, "I'm Into Something Good", made famous by Hermans Hermits. The Cookies also released several recordings under pseudonyms, mostly with Margaret Ross on lead. Their alter egos on recordings were the Palisades (Chairman), the Stepping Stones (Philips), the Cinderellas (Dimension) and the Honey Bees (Fontana 1939 only). In April 1967 they released their last record, produced by the Tokens. Darlene McCrea returned to replace her sister for this recording. Dorothy Jones died on Christmas Day 2010, from complications of Alzheimer's disease, in Columbus, Ohio, at the age of 76. Margaret Ross, now Margaret Williams, tours today as the Cookies with new back-up singers. She also performs with Barbara Harris and the Toys occasionally. Darlene McCrea died February 4, 2013. Dorothy, Beulah and Margaret were first cousins. Their respective mothers were sisters. ^ Roberts, David (2006). British Hit Singles & Albums (19th ed.). London: Guinness World Records Limited. p. 119. ISBN 1-904994-10-5. ^ Clemente, John (2000). Girl Groups -- Fabulous Females That Rocked The World. Iola, Wisc. Krause Publications. pp. 276. ISBN 0-87341-816-6. ^ Clemente, John (2013). Girl Groups -- Fabulous Females Who Rocked The World. Bloomington, IN Authorhouse Publications. pp. 623. ISBN 978-1-4772-7633-4 (sc); ISBN 978-1-4772-8128-4 (e).